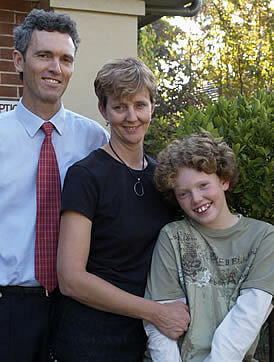 Dr. Damian Christian (Chiropractor) with his wife, Sally and son, William. Chiropractor Dr Christian’s childhood family came to north-east Victoria in 1973, farming in the Kiewa Valley after commencing his high school studies at the local school, Tallangatta Secondary High School. Dr Christian (Chiropractor) was one of the inaugural students in Australia to complete a double degree in Chiropractic. He received a Bachelor of Science from the University of New South Wales and a Post Graduate Diploma in Chiropractic from the Sydney College of Chiropractic. Since that time this course has been embedded into the chiropractic programme at Macquarie University as the School of Chiropractic. Chiropractor Dr Christian’s commitment to chiropractic excellence is evidenced by the fact that he attends a minimum of 40 hours post-graduate studies each year.